This stuff is good, and holy wow, it’s not loaded up with refined sugar and other nastiness. When I first saw “olive oil” on the list of ingredients for the recipe I used as a base, I was a bit taken aback; however, you won’t even notice the taste of the olive oil, other than a deeper, richer overall flavor, and your heart will thank you. This tastes like apple pie without the crust! 1-2 Tbsp. honey, depending upon how sweet you want it. I left the peels on, because they’re so healthy and a great source of fiber. You can take them off if you like a smoother, peel-free applesauce. Mind ended up more like a chutney, because I didn’t mash them much. Optionally peel then core and dice apples into one-inch or smaller chunks. If your chunks are approximately the same size, they will cook more evenly. Lump those suckers into a large mixing bowl. Drizzle the honey, olive oil, brown sugar and, if you feel you must, a dash of Kosher salt over the apples. Mix everything up with a big spoon or your hands to make sure all of the apple pieces are well-coated. Spread the apples out in an even layer on a sturdy baking sheet. Roast for 15 to 20 minutes, stirring a bit midway through, until the apples are golden brown and soft, but not little bunches of mush. 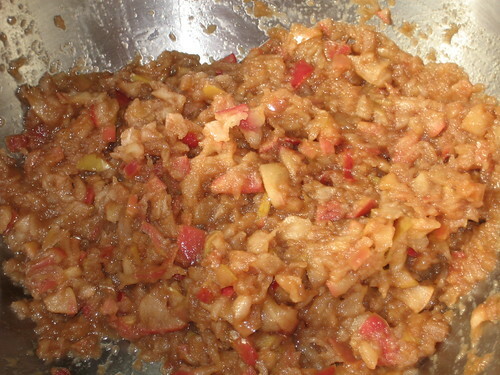 Remove from the apples from the oven and eat as is or smash up a bit to your preferred level of chunkiness. Serve immediately for apple-pie results, or chill and let the flavors marry for most excellent flavors the next day and beyond. Keeps brilliantly in the fridge. Your recipe sounds good, I’ll try the olive oil. So,ya ought to try yours with some good ol’ animal crackers, m-mm, that’s low cal pie! Animal crackers! I never would have thought of that. 🙂 Great idea, I’ll give it a try, thanks!